There are two schools of Republican thought on what to do about the agreement. Both have merit. Republicans have more or less coalesced into two primary political camps regarding the nuclear deal with Iran. Call them, "the Fixers" and "the Walkers." Both see the agreement as fundamentally flawed and would never have offered what the Obama administration gave away. They recognize the deal as both technically and structurally deficient, setting Iran on a patient path toward nuclear weapons while tying America's hands until the Iranian nuclear program is industrial in scale, lethal in scope, and too costly and difficult to destroy from the outside. While sharing the same objective vis-à-vis Iran, the two camps differ on the strategy for preventing such an outcome and thus favor divergent paths to reestablish American leverage. Their conflicting aims will become all the more pronounced once President Trump withholds his certification of the deal as a first step down one path or the other. The Fixers are focused on plugging three primary holes in the agreement — namely, tightening its vast verifications loopholes, preventing the advancement of Iran's ballistic-missile program, and scrapping the sunset clauses that are time-based rather than behavior-based. To renegotiate would require reestablishing a measure of American leverage, first over the countries the Obama administration led during the years of nuclear discussions and second over the Iranians, who already received most of the deal's goodies upfront and can be expected to find little in the way of positive inducements from a new process. Withholding certification fits that bill as an initial step for the Fixers because it declares that the deal as it stands is not in America's interest. It puts Europe and Iran on notice that the U.S. is prepared to walk away if new provisions are not added and the flaws remain unfixed. Tactically, it represents the initial step in a strategy called "decertify, waive, slap, and fix" that has been developed in think tanks such as the Foundation for the Defense of Democracies and the Institute for Science and International Security. It involves a comprehensive policy they describe in seven op-eds that would utilize all instruments of national power — including a major pressure component outside of the nuclear agreement — designed to curb their unwelcome activities and increase America's leverage while still sticking to the deal. President Trump appears set to adopt the fix-it approach before the October 15 certification deadline and he has found some unlikely Capitol Hill allies who until recently were eagerly awaiting the death of the deal, having already dug the proverbial hole and purchased the headstone. Back in July, before the last deadline for certification, a group of foreign-policy hawks including Senators Tom Cotton (R., Ark. ), Marco Rubio (R., Fla.), Ted Cruz (R., Texas), and David Perdue (R., Ga.), sent a letter to Secretary of State Rex Tillerson urging him not to recertify the deal before the last deadline in July. Cotton, speaking to a gathering at the Council on Foreign Relations, recently laid out his own thinking: "Congress and the president, working together, should lay out how the deal must change and, if it doesn't, the consequences Iran will face." Most other Republican lawmakers have sought to avoid publicly choosing between the two approaches, apparently enjoying the political benefits of remaining a hawk on Iran even if perched on the fence. While the Fixers are urging the president to adopt their "decertify, waive, slap, and fix" plan, the Walkers are pressing for what could be called, a "wave, slap, and walk" approach: Wave goodbye, slap on sanctions, and walk away. Their position stems from the premise that the regime in Tehran is determined to acquire nuclear weapons no matter the cost and will grudgingly endure any economic hardship to reach that goal. As they see the problem, the deal's central defect arises not from the technical loopholes the Fixers are trying to tighten but from the original sin Obama committed: recognizing Iran's unrestrained right to enrich uranium in a set amount of time in a deal that conferred legal status on the nuclear program. Even worse, Team Obama's collective flinch was baked into the deal's foundation before the negotiations even got started, not as a final concession once the other crucial American requirements were met. From the Walkers' perspective, any renegotiation within the existing framework amounts to a post-collision attempt to save the Titanic. Ambassador John Bolton put forward perhaps the most comprehensive outline of the Walkers' strategy in a recently published NRO piece. Bolton's framework was supported by the Center for Security Policy in a letter sent to the president and signed by 45 national-security experts. According to Bolton's plan, after abrogating the deal the U.S. should "recreate a new counter-proliferation coalition to replace the one squandered by the previous Administration, including our European allies, Israel, and the Gulf states." He calls for the imposition of both unilateral and multilateral sanctions to be enacted independent of the United Nations Security Council — where they are sure to be watered down — and the adoption of immediate measures to "limit Iran's malicious activities" and protect America's allies. At the same time, the strategy seems to rely rather heavily on Israel being ready, willing, and able to bomb Iranian facilities. It's not clear that they are. The case for ditching the deal has a lot of merit. 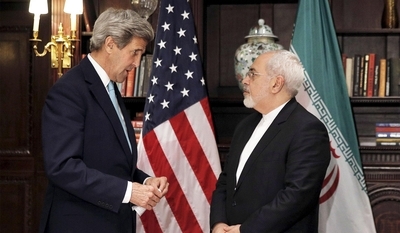 Iran has repeatedly stated that there will be no further discussions. As it stands today, there isn't even an understanding between the U.S. and its European allies of what a fixed deal would look like, much less a common agreement on what constitutes a Iranian breach of the current arrangement. The possibility of getting Russia and China to play along also seems exceedingly remote. And the leverage America would create by refusing to certify the deal but remaining a prisoner to it — even while slapping Iran with sanctions — would be offset by upfront concessions to Iran that the U.S. should never have made. Closing down Iran's paths to nuclear weapons remains at the heart of the Fixers' efforts. The Walkers' approach centers on Iran's malicious behavior, of which their nuclear activity is but one example, albeit a major one. As the 45 national security experts expressed in their letter, "It is time to move beyond President Obama's appeasement of Iran and to begin work on a comprehensive new approach that fully addresses the menace that the Iranian regime increasingly poses to American and international security." Although neither plan specifically endorses the military option, it must remain on the table as a credible threat. That is especially true if the U.S. goes the way of the walk. After all, if Iran is free from the agreement they could immediately ramp up their uranium enrichment to 20 percent, within reach of weapons-grade material. That would put the U.S. in the position of choosing between military action and having its bluff called by Iran. As the president weighs his options he would do well to remember that good politics doesn't necessarily mean good policy and vice versa. In the meantime, as different as the strategic paths before him are, he can take solace in knowing that most Americans should welcome a plan that finally pushes back on Iran's nefarious activities after eight years of Obama's strategic embrace.